At Sweat and Butter, we encourage clients to adopt a diet rich in vegetables, starchy tubers, and high-quality protein and fat sources (e.g. things with a face or the potential to grown into something with a face). This should theoretically provide a perfect balance of macronutrients while supplying you with a surplus of micronutrients. Vitamin and mineral supplements should thus be superfluous, yet, despite even the cleanest, most whole-foods-centered diet, you may still benefit from a supplement or two. Mg is a group two element on the periodic table. That puts it in the same group as beryllium, strontium, and calcium. 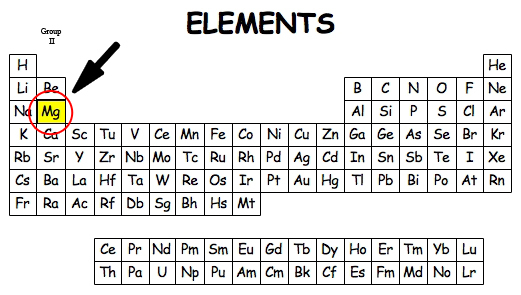 A clever Russian chemist named Dmitri Mendeleev clumped elements into families based on their properties. An element with a charge is called an electrolyte, and these charges are important for maintaining an electrochemical gradient across cell membranes. This gradient is critical to nearly every process in the human body! Group one and two elements are minerals that look like a chunk of bling (ore) when they are dug out of the ground. Ore requires a great deal of processing until it can be used to fortify processed foods, make supplements, or produce fun powders to be used in chemistry labs. In nature, plants pull Mg in through their roots to incorporate it - and other minerals - into their cell wells and enzymatic processes. Animals then eat the plants or the bones of other animals, and the Mg stored in these vessels is promptly packed away into our skeletons. About 50-60% of your body's Mg can be found stashed away in bone. The other half resides in tissue cells or surfs around in the blood keeping these other processes ticking. How does magnesium enter the diet? These conditions are sequelae that develop long after you begin to notice the symptoms of deficiency, but, as my disclaimer warns, you can't rely on a list of symptoms to diagnose micronutrient deficiency. Mg simply wears too many different hats in order to diagnose it clinically. Even those who live the healthiest lifestyles tend to be Mg deficient. Why? Well...that's not entirely clear, but a few factors are at least partially responsible: 1) processed "staple" foods like bread and pasta provide little nourishment, 2) our water requires processing to be potable (stripping natural mineral content), and 3) seeds grown in nutrient-depleted soil develop into nutrient-depleted plants (one study even shows that fertilizers, which are often high in potassium, exacerbate the problem by inhibiting a plant's ability to uptake Mg from the soil). Statistically speaking, if this is the first time you are visiting the Sweat and Butter Journal or that you have heard the term "magnesium", there is a high likelihood that you are deficient in this micronutrient, as the Community Nutrition Mapping Project has determined that only 43% of the United States is meeting their RDA. This corroborates with the National Health and Nutrition Examination Survey (NHANES). A study looking specifically at data collected by the NHANES determined that, among U.S. adults who were not supplementing with the mineral, 68% consumed less than the RDA and 19% consumed less than half the RDA. Oy vey! Mg deficiency has been shown in several studies (here and here) to increase pro-inflammatory cytokines. IL-6, Substance P, and TNF-alpha have been implicated. We can gauge the degree of inflammation in an individual by measuring levels of C-reactive protein (CRP), which is a non-specific biomarker for general systemic inflammation. The clinical evidence shows that CRP levels are inversely related to serum Mg levels in certain patient populations. In other words, Mg tempers the inflammatory response. Deficiency in Mg is thus no bueno, as my Mexican better half would say, since inflammation is the name of the game for virtually every known pathology (aka disease) that ails us, including atherosclerosis, osteoporosis, cancer, damage to the intestinal lining, fertility, post-workout recovery, and even the aging process. No bueno, indeed. Mg deficiency may be contributing to your hypertension. Numerous studies have linked low Mg to blood pressure. Studies have also shown that supplementing with Mg is protective against cardiovascular disease. (1, 2, 3, 4) Some literature reviews, however, have been less than convincing. (5, 6) Such is the life of a scientific hypothesis! As you'll come to realize, supplementation can't hurt, despite some less than thrilling reviews. Neurons are the cells of our brain and nervous system, and they communicate by means of neurotransmitters. Depression and anxiety fall into the same family of diagnoses in psychiatry. They both result from dysregulation of serotonin and/or norepinephrine, two potent neurotransmitters. Pyschiatrists treat depression and anxiety by giving drugs (SSRIs and SNRIs) that increase the effects of these two molecules at their respective receptors, which happen to be abundant in the limbic system (i.e. the brain's reward center). NMDA is another receptor implicated in depressive symptoms. When it's open, calcium rushes into neuronal cell bodies, causing an unrelenting firing of the neuron and exhausting its neurotransmitters. The mechanism behind which Mg positively modulates depressive symptoms is poorly understood, as a great deal of the available research examined animal models. These studies suggest that Mg activates serotonin and norepinephrine receptors (good for depression) and blocks NMDA receptors, regulating the steady release of neurotransmitters to neighboring brain cells (also good for depression). More on the topic here. In addition to blocking NMDA receptors, Mg also activates gamma-Aminobutyric acid (GABA) receptors. GABA is one of the most prevalent inhibitory neurotransmitters in our central nervous system. It's described as inhibitory because everything it touches results in the down-regulation of some activity somewhere in the body. If you recall from our discussion above, Mg regulates the release of neurotransmitters by preventing a continuous rush of calcium into neuron cell bodies. Remember: calcium carries a positive charge (+). GABA receptors are linked to channels that allow chloride to rush in. Chloride has a negative charge (-). It's reasonable to assume that if a positively charged ion causes the release of neurotransmitters, then having more of a negatively charged ion would increase the requirement of a positive ion (i.e. increase the threshold) before neurotransmitters are released. Mg hits the GABA receptors, soothing your central nervous system enough to help you fall asleep. In 2012, a double-blind, placebo-controlled study was published that showed that both subjective and objective measures of insomnia improved in elderly people that supplemented with Mg. A lot more work needs to be done in the field of sleep, but anecdotally many people - including my mother - swear by Mg as a sleep aid. to interact with special cell membrane proteins called GLUT receptors in order for glucose to get in. When there is excess blood sugar, it's stored in the liver, muscle, and fat cells for use later on. It isn't fully understood how insulin resistance comes about, but it's likely related to a complicated signaling pathway inside cells, the activity of which reflects a cell's energy stores. If tissues are bombarded with excess sugar over long periods of time, cells will eventually respond with: "Hold up! We've got enough! ", and they'll inactivate the GLUT receptors on their membranes. The cells become resistant to the sugar, thus turning insulin away to find another place to depot the sweet stuff. 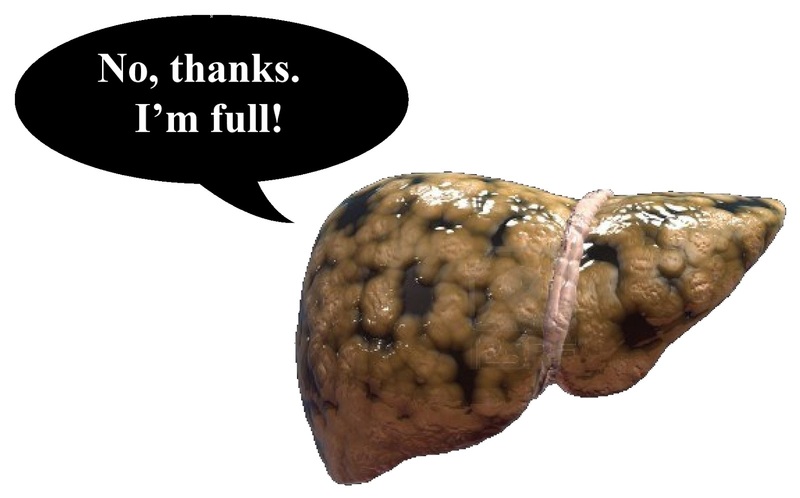 There is evidence that the liver, which has the ability to harbor a ton of sugar in the form of glycogen, becomes resistant before muscle and fat cells. If you are bombarding your blood stream with sugar, as the typical american diet tends to do, this is what happens to your liver cells: they become resistant to insulin and thus sugar storage. The fat cells will begin to take in more sugar and store it as fat. Over time, it becomes harder and harder for insulin to do its job, so the pancreas takes charge by bombarding these tissues with insulin, a state known as hyperinsulinemia. This is the process that we refer to as "metabolic syndrome", and it's a bad place to be. On the flip side, we know that exercise improves insulin sensitivity. We also know that eating a diet low in sugary crap improves insulin sensitivity. One more step you could take is to supplement with Mg, and there are numerous studies to back this up (one avocado, two avocado, three avocado, floor). In addition, insulin resistance may result in Mg deficiency. Changes in potassium concentration in the blood can have critical effects around the body, particularly on cardiac function. Potassium largely resides on the inside of cells (i.e. intracellularly). Special pumps that maintain the relative concentration of potassium intracellularly rely on Mg to operate properly. Mg deficiency also detracts from skeletal bone's ability to take up calcium. If you're supplementing with calcium and Vitamin D, you also need Mg! In the medical world, we like to keep the concentration of Mg in your blood between 1.7 and 2.2 mg/dL. Getting tested for deficiency is a simple blood test. Have your levels tested before you start supplementing, because Mg toxicity is another monster: decreased muscle tone, pulmonary edema, respiratory depression, low blood pressure, and many of the same symptoms listed for Mg deficiency. See why it's difficult to use a simple symptom checklist to diagnose these deficiencies?! Always ease into supplementation. Consuming extremely high doses of just about anything (exceptions: hugs and Battlestar Galactica circa 2004) can be dangerous, so take it easy with this stuff! Having said that, you would have to try really hard to accidentally ingest too much Mg. In OB/Gyn practice, a pregnant woman with signs of pre-eclampsia is given a 4-6 gram dose of the stuff right off the bat then an additional 1-2 g every hour thereafter for the micronutrient's neuroprotective effect on the fetus. We monitor for Mg toxicity, and, even with these incredibly high doses, we don't see it occur uniformly in all pre-eclamptic patients. Like the levels of the other electrolytes floating around in your blood, Mg levels are regulated by the kidneys. If you have any doubt about the sufficiency of your kidney function, please consult your doctor before you start supplementing with Mg! Because Mg is relatively new on the scene, the optimal daily dose is unclear. Studies mentioned above were experimenting with up to 2500 mg daily. I recommend starting with the RDA, then slowly creeping this daily dose upwards to around 800 mg depending on how you're tolerating the mineral. If you are concurrently supplementing with zinc, this may inhibit absorption of Mg from the gut, so take this into consideration. Oral: Mg malate and Mg glycinate are your best bet. These chelated forms are absorbed well in the gut, so they are less likely to cause diarrhea than Mg citrate. Radiant Light Nutrition has a pretty solid product. Chris Kresser recommends Douglas Labs' products on his website. Finally, Jigsaw Health has an extended-release variety that gets good reviews, though it's a little pricier. Topical: I can't say for sure how I feel about topical Mg supplementation. Mg chloride oil can be irritating to the skin. I picked up a few samples of creams and sprays from Radiant Light Nutrition at AHS13, and Stephanie seems to be tolerating them pretty well, though we haven't checked her serum Mg to determine for sure whether or not these sprays and lotions deliver enough of the mineral transdermally. If you absolutely can't tolerate oral forms of supplementation, then I think that this is worth a shot. Joslin's Diabetes Mellitus, 14th edition. 2005. Digital. This is a great post! Thanks for including the detailed description of how insulin resistance works... I've been doing a fat-adapted diet since January and when others ask me about my eating habits & why sugar is bad, I've had a hard time explaining the insulin resistance part because I didn't fully understand it. This helps a lot! I've really enjoyed the other posts on the site too, looking forward to more! Thanks, Anne-Marie, for the kind words! We are happy to hear that you are benefiting from our journal. I hope you stay posted with our posts in the future! Please let us know if you have any questions down the road. And good luck in any races you compete in this fall!